Igloo Songwriter Launches Debut Album! 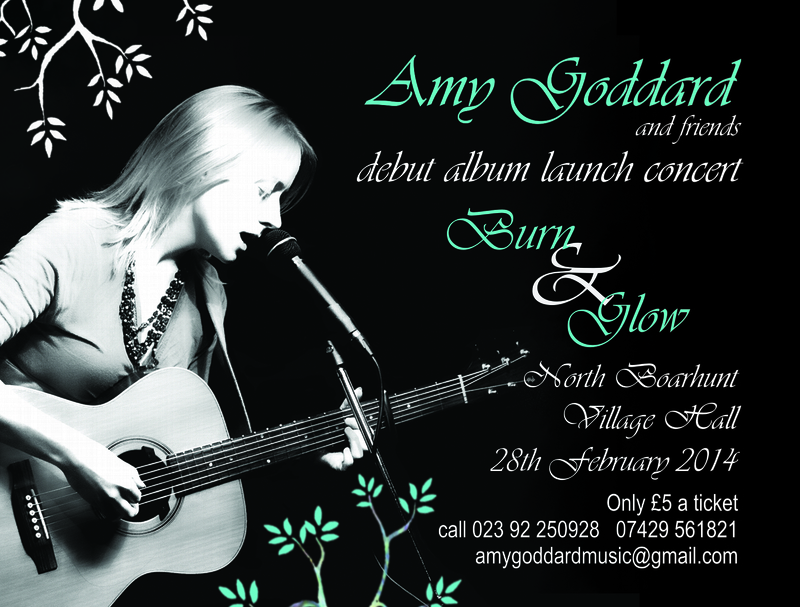 “On February 28th 2014 I will be launching my debut solo album with a concert at North Boarhunt Village Hall, the home of Forest Folk. It’s turned into an epic project so here’s a bit about it. I started writing songs as soon as I could, somewhat erratically, string 3 guitar chords together in the style of “Oh Mary don’t you….. D7….. weep don’t you mourn, Oh Mary don’t you….G…… weep don’t you mourn” etc. This was about 1995. After several songs containing the kind of social angst appropriate for a teenager wearing tie-dye and listening to the Levellers I decided I wasn’t much good at it. I spent the next few years honing my guitar playing skills and going through my classical grades. Much as I enjoyed classical playing though it never really hit the spot of a really well crafted song. I had a few more goes at song writing but they usually ended with the frustration of a half decent verse and chorus and no idea how to finish the song. Scroll forward several years and I started playing folk and acoustic music with my friend Helen. Some local folkies may remember Helen and Amy from a few years ago. We wrote a few songs together and she seemed able to finish what I had started, this was progress! After a little while, Helen’s health problems meant she had to give up performance and I was left on my own. Not being blessed with the power of Helen’s voice I had difficulty finding material that I could cover comfortably and consistently. So, I thought I had better have another go at writing my own. That way I could write what I COULD sing. Well, it worked for Bob Dylan didn’t it? Enter stage left, Igloo music, or more precisely DiElle, the owner of the business. I found her when researching singing lessons. I joined a group class that turned out to be just myself and my husband, Matt. 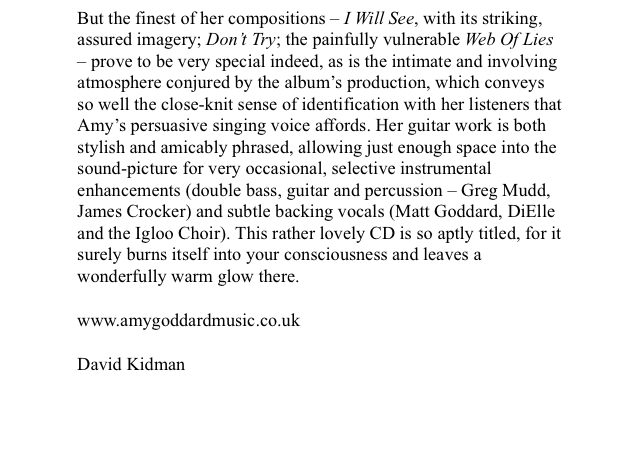 (This was in the very early days of Igloo music I must add, the singing courses are now very well supported.) DiElle teaches a holistic approach to singing based on the principle that a voice used in a way that’s healthy produces the most pleasing and resonant sound. The technique is wonderful but I had found much more than that. I found in DiElle a completely committed vocal coach who actively went out of her way to encourage and motivate her students. 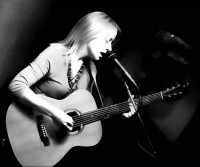 As a competent and published songwriter herself, she started organizing songwriting workshops. I began to realise what the problem with my attempts at writing had been: I didn’t really know what I was trying to say! I had had some vague notion of picking up a pencil and waiting for inspiration, in the form of a completed lyric, to arrive. Through her workshops I learnt that a song is often something that has been carefully crafted with a reasonable amount of sweat and tears. So, now I had the idea that you needed to really brainstorm a subject and have something to say to write a good song. I also learned some clever techniques for using life experience in song writing. These involved writing about the feelings and images associated with a subject but without actually explaining in detail what the subject is. The beauty of this type of writing is that it leaves the specifics to the listener, if they have felt the human emotions of love, pain, betrayal etc. they will use their own experience to fill in the picture. It’s a powerful tool! This technique allowed me to write a song about playing the guitar which did NOT include the line: “I like playing my guitar ‘cos it makes me feel betta!” Actually, Make You Whole sounds more like a love song. You have to know the background of it or pick up on some subtle hints to grasp the original inspiration. I also used this technique to write about an unpleasant time I went through that ended in an employment tribunal. The song is about the feeling of betrayal and hopefully listeners who have felt betrayed in any circumstances will relate to that. That was it, I was hooked! 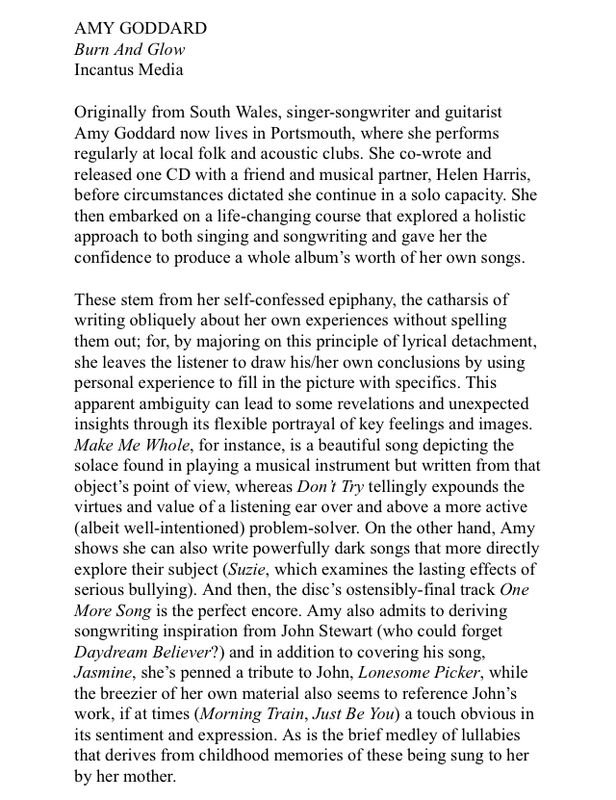 The cathartic experience of writing obliquely about my own experiences, without spelling them out, and getting positive feedback from people in the local folk clubs was completely addictive. There are other songs on the album that are more direct in the lyric writing but by then I had started to learn how to craft a song, how to draft and redraft until you’re happy with it and not to give up at the first difficult rhyme. So really an album was the natural progression. It’s been a steep learning curve. Combining the use of antiquated home recording equipment, to keep costs down, and a fierce tendency towards perfectionism hasn’t been easy. But as I type it’s finished! Ahhhhhhh… It is in the hands of a professional who is mastering it ready for CD production. I just have the artwork to finish. Another steep learning curve. Don’t talk to me about RGB v’s CMYK or DPI! But that’s a whole other story.